Driving a car is something that most people take for granted. No group of people know this more than the visually impaired. But CBS News science and technology correspondent Daniel Sieberg reports on a groundbreaking technology that has blind people excited about a future on the road. Visually impaired and blind people are the first to say that overcoming challenges like getting around is just a part of life. But driving a car is another matter entirely, and largely off-limits. That is, until now. For a nation of drivers, nothing says freedom like getting behind the wheel of a car. It's a feeling that eludes the more than 20 million Americans who are visually impaired, like Ty Case. "You kind of feel like you lose your identity really," says Case, who went blind 14 years ago after complications with juvenile diabetes. Unable to drive during that time, he recently got a chance to go for a spin again. 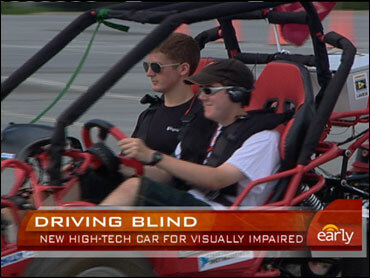 Engineers at Virginia Tech have now created a vehicle that visually impaired people can actually drive. "The driver drives the car via a regular steering wheel and an accelerator and a brake," Dennis Hong explains. The prototype was developed by Hong and a team of robotics students at the request of the National Federation of Blind People. They did it with just $3,000 in grant money. "So how it works, a laser shoots out from the sensor right over here, right if there's an obstacle in front of it, it bounces off,' Hong explains. That laser pointer feeds data to an onboard computer that then communicates what's ahead to the driver. This vehicle is actually talking to the driver, in a sense. A vest vibrates, that tells he driver that he or she is either coming up to an obstacle or is going a little fast. Drivers also get audio cues that are telling them to turn slight left or slight right as they're going forward. At a recent test in College Park, Md., blind teenagers came from as far away as Iowa for the chance to experience the thrill of driving for the first time. "I thought it was probably the best thing that I've ever done in my life," says 17-year-old Jeremy Ellis, of Belle Plaine, Iowa. "It was exciting and i just had so much more freedom and it jut really made it seem like it could really be a reality someday," Addie Hugen, 16, adds. And there are useful applications for the technology beyond benefits for the blind -- especially handy for today's drivers since recent studies have found that drivers distracted by talking on a cell phone are four times as likely to get in an accident. But with the technology still years away from being roadworthy, people like Ty Case still has to rely on family and good friends to get around for now. Virginia Tech's Dennis Hong acknowledges that the thought of having blind drivers on the road is can be a little scary for some people. He says a lot of problems still need to be solved, but that the technology will be ready before society will be. It took nine graduate students two semesters to develop the ride -- one semester for engineering, one for assembly.